How to develop Windows Forms softphone using Visual Basic .NET? This page provides information on how to use the C# VoIP SIP source implementation of Ozeki VoIP SDK for creating a VB.Net Softphone. You can also find information about the utilization, configuration, and the source code of this sample program. Read them and be familiar with the versatile functions that are offered by Ozeki VoIP SIP SDK. What is VB.Net? How to get started? Visual Basic .NET (VB.NET) is an object-oriented computer programming language that can be viewed as an evolution of the classic Visual Basic (VB), implemented on the .NET Framework. Microsoft currently supplies two main editions of IDEs for developing in Visual Basic: Microsoft Visual Studio 2012, which is commercial software and Visual Basic Express Edition 2012, which is free of charge. Ozeki VB.NET Softphone Sample is a sample program that is equipped with telephone functions. This sample program was developed for presentation purposes and it presents the essential and simple to use services of Ozeki VoIP SIP SDK. This sample program represents a single line phone that is able to forward and receive calls, to send and receive DTMF signals for navigating in IVR systems. Ozeki Windows Forms Softphone example for VB.NET is a really handy and representative example that is based on Ozeki VoIP SIP SDK. It provides the opportunity to try out some functions of a VoIP softphone which you can build and develop according to your needs in VB.Net. The sample program uses VoIP technology so you can use it to start and receive telephone calls. DTMF signals can also be sent or received with it and with these DTMF signals you can navigate in IVR systems. These are just a few functions that are offered by this sample program. There is a chance for you to develop your own softphone further based on this sample program and you can customize it according to your needs. You can find here how to configure the C# VoIP SIP source implementation of Ozeki VoIP SDK for creating a VB.Net Softphone. Where "true" is the registrationRequired parameter: this is a true value and it allows to receive calls (not just to initiate them) in case the registration is successful. (In case of "False" value registration, calls can only be initiated). In the sample program "oz891" marks the SipAccount displayname, the username, the registername and the registerpassword. The following two parameters are the IP address or domain address and the port of the SIP PBX. The GUI of this sample program has been developed with Microsoft Windows Forms technology. The reason for this is that it allows great flexibility regarding the appearance of the program. The main goal of this sample program is to demonstrate the simple and convenient use of Ozeki SDK. 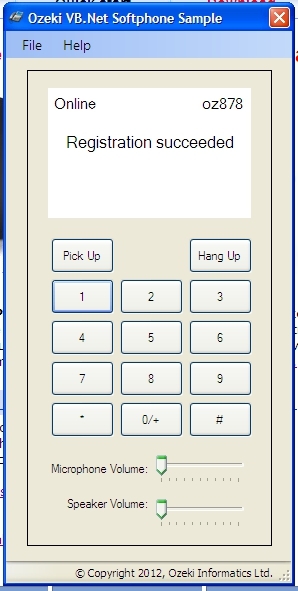 It's recommended to create a simple but representative GUI (Figure 1) with basic telephone functions. The softphone has all the functions that are required for establishing phone calls effectively like make a call, receive a call, sending and receiving DTMF signals and display of call events on the interface. After running the program the telephone automatically registers to the given SIP PBX with the given SIP account. If the registration process is ended successfully we can see Registration succeeded on the display. From this point the softphone is ready to establish and receive calls, to send and receive DTMF signals during calls for navigating in IVR systems. (The source code of the sample program includes settings that depend on the environment so after the download do not forget to customize it. For details please go to Configuration section). PhoneForm.vb code-behind file is belonging to the program interface describes the control events related to the interface and connects the GUI with the logics. The sample program focuses on simplicity and representativeness. The PhoneForm.vb file includes the full logic of the sample program. By opening this PhoneForm.vb file, you can see a few lines of declaration right the beginning that are needed for the use of Ozeki VoIP SIP SDK. ISoftPhone: it represents a telephone, and its telephone line is represented by the IPhoneLine. There can be more telephone lines which means that we can develop a multi line phone. Iphoneline: it represents a telephone line that we can register to a SIP PBX for example, Asterisk, 3CX, or maybe to other PBXs that are offered by SIP providers. Registration happens through SIP account. PhoneLineState: it is an enum type that represents the status of the telephone line with the PBX: e.g., registered, not registered, successful/unsuccessful registration. IPhoneCall: it represents a call: the status of the call, the direction of the call, on which telephone line it was created, the called person, etc. Microphone: class for capturing audio data with microphone. Speaker: class for playing audio through speakers. PhoneCallAudioReceiver: it can receive audio data from the attached 'IPhoneCall' object. By subscribing to the 'Loaded' event of Windows Form windows, it is possible to start the initialization and registration of Ozeki SDK softphone right after 'PhoneMain' window is loaded. Create an instance of the phone via the "softPhone" object and give the IP address of your computer and the port domain that can be used by the phone. Finally specify the port, at which the SIM messages arriving from the PBX are listened, as the last parameter. Create a phoneLine with a SIP account that can be the user account of your corporate SIP PBX or a free SIP provider account. To display the status of the created telephone line, sign up to its "phoneLine.RegistrationStateChanged" event. Ozeki SDK represents the incoming and outgoing calls through IPhoneCall interface. This interface includes the status of the given call, on which line it was created and who is the called person. On this object we can pick up or hang up calls. CallStateChanged: this event is for displaying the changes in the call status. MediaDataRecived: the audio data from the remote end arrive via this event. DtmfReceived: this event is responsible for processing DTMF signals arriving from the remote end. To wire up to these necessary events you only need to actually start a call. You can do it with the Start() function of the call object. In this example it is the "call.Start()" line. You need to take care of ending the call only if you want to end it. Just like the "Pick Up" button the "Hang Up" button is also connected to the event manager. Displaying call status: Ozeki VoIP SIP SDK provides the following information about the call status: ringing, InCall, Completed, Rejected etc. These call statuses are displayed via the CallStateChange event of "call" object. In this sample program I only focused on the essential options for being simple but demonstrative. Based on these essential options you can easily create further options. The code above is only for reacting to the changes in the call status. For example: If the phone is picked up it starts the voice recording so we can send our audio data to the other party. Moreover it initializes the devices that are necessary for playing incoming audio data. Handling incoming audio data: since you've wired up to the MediaDataReceived event of the "call" in case of both outgoing and incoming calls, the incoming PCM audio data only needs to be forwarded to the sound system as it is demonstrated below. Handling outgoing audio data: the PCM audio data originating from the microphone is forwarded to the "call" object that represents the actual call via the process of SendMediaData. Then audio data is compressed by Ozeki SIP SDK with the right audio codecs and then sent to the intended person according to the built communication channel. Receiving DTMF signals: DTMF signals can be received similarly to audio data. Regarding processing, this sample program only displays the reference value of the received DTMF signal on the interface. Volume control: Ozeki VoIP SIP SDK provides the possibility for controlling the volume of the microphone and the speaker. You can use a Trackbar element on the GUI for this purpose and set the actual volume according to the track bar value like in the following two functions. The volume is set every time you change the state of the tracker on the certain Trackbar. This can be implemented easily in the event handler functions for the Trackbar objects (see the following code). The example program sets the speaker and microphone volume according to the state of the Trackbar trackers using percentage values, but you can also use the actual value of the tracker if you want. In that case you need to delete the "/ 100" section from the code.